Nature-based and eco-friendly themes are particularly suited to DIY brides. I’ve recently worked on a no fuss, no “bling”, but rather a simple and natural “enchanted garden” affair. 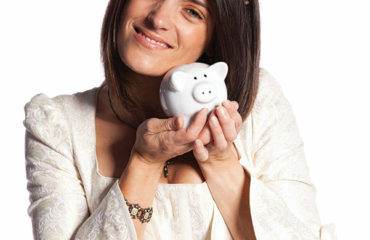 Here are some DIY friendly elements from weddings that were impactful and super affordable. good time management and a patient groom. This area comprises most of your décor real estate, so it’s vital that you nail your theme here. 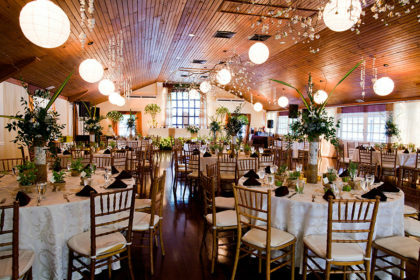 For this type wedding linens should be natural in texture and/or colour. I used ivory damask linens with chocolate napkins and burlap/crocus bag runners on the head table. TIP: Burlap is particularly nice to use as the edges fray nicely to create a fringe (no sewing required). 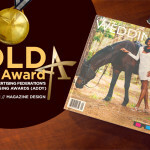 Burlap can also be used to create overlays if desired. 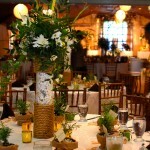 The floral arrangement centerpiece comprised chrysanthemums and local anthuriums. 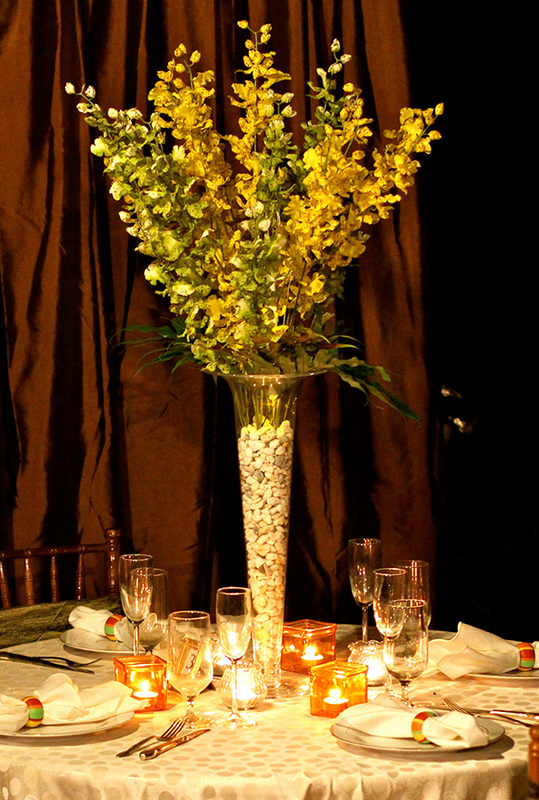 The flowers were set in a tall glass vase, the top and bottom of which was wrapped in raw rope. The vase was filled with inexpensive sand under the roped portion and white deco stones in the exposed portion. TIPS: Local flowers are cheaper and more easily accessible than foreign flowers; glass vases are now rentable from a number of design and accessory rental companies; and deco stone is sold by the bag at almost any garden shop, for less than TT$60.00 a bag (one bag was able to fill nine vases). If you’re not a florist you can still create relevant drama by using flowers that lend themselves to spray type arrangements (see photo next page), which are very easy to put together. 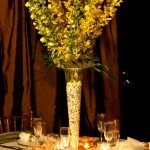 Orchids and calla lilies are good examples of this type of flower. There are a number of tasteful looking silk orchids and calla lilies on the local market that are quite reasonably priced (you can especially take advantage of wholesale prices). 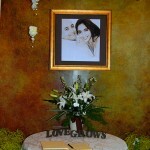 Silk arrangements work particularly well for the DIY bride as arrangements can be made well in advance of the wedding. Ikebana styled arrangements or the common bromeliad (the plants that grow on trees and telephone wires) sprayed gold and lightly glittered arranged on natural stone tiles would also be quite workable with this theme. 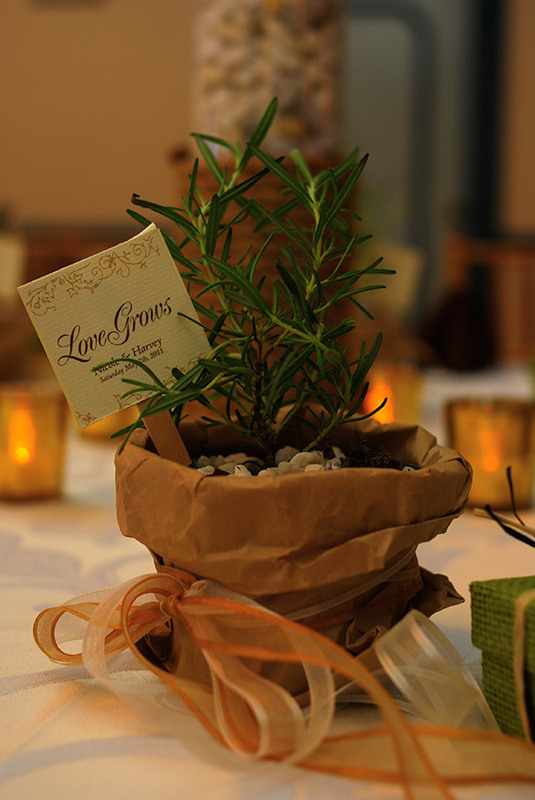 The wedding theme was “LOVE GROWS”, so for keepsakes, each guest was given a small potted plant. In this case rosemary, lavender and balleria. 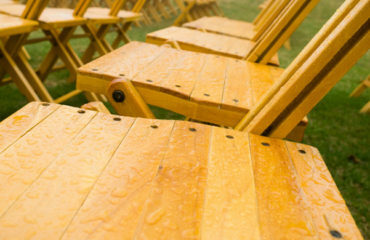 These were also placed on the tables to add to the garden look and feel. To embellish these, each plant was placed into a 2lb brown paper bag with the top rolled down to just cover the pot and tied off with two shades of ribbon. The tag, depicting the theme to the front and care instructions to the back, was attached to a craft stick or as we say in Trinidad, a palette stick (available in almost any colour at local craft stores). Note: the front and back were printed on two separate tags and stuck on the front and back of the stick to ensure that the back was readable. TIPS: The potted plant was sourced locally for TT$5.00. 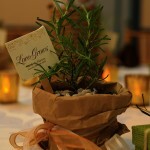 Another option for an inexpensive keepsake is customized flower seed packets. The ceiling treatment consisted of dried branches embellished with tasteful silk flowers, handmade silk flower garlands and artificial, flickering votive candles. For a touch of “bling”, faux Swarovski crystal beads can be added. 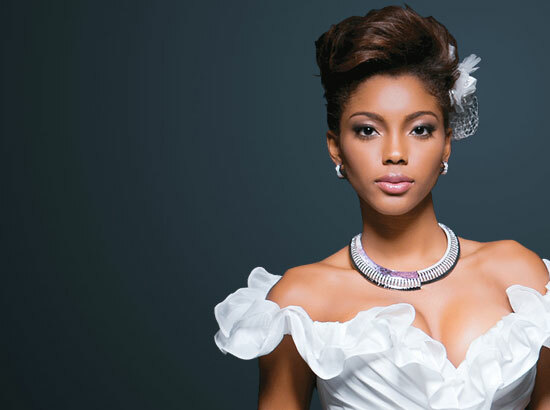 TIP: Use whites, pastels or brightly coloured flowers for an evening wedding, as the human eye loses its ability to differentiate colour with the reduction of light. For warm intimacy with that touch of glitz use white or amber string lights, votives and votive holders, metallic and/or crystal finishes (glitter, spray paint, metallic chargers, metallic or crystal beads). 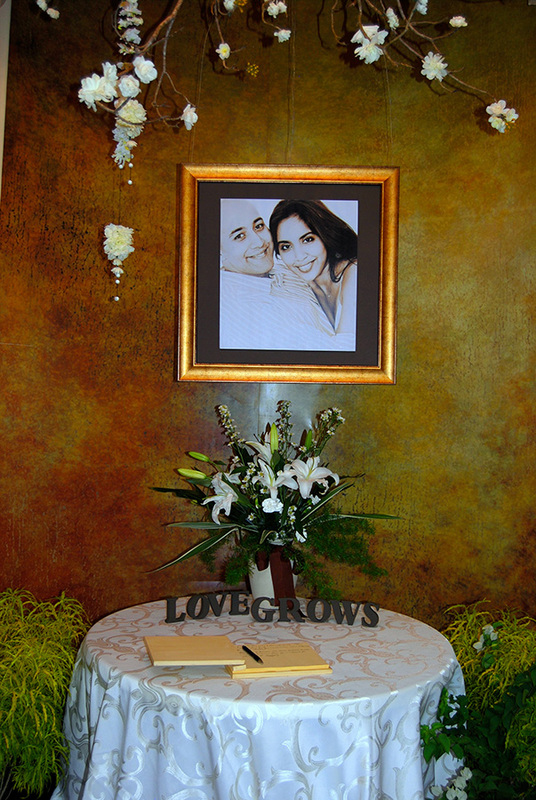 In the foyer, where the guest book table was located, I changed the wall texture of the existing wall by printing a large format stone texture on to a substrate, which was easily mountable in the space. TIP: This may be financially out of reach for some brides but an alternative texture can be created using crumpled brown paper with a gold distressed finish applied to it, or dried leaf overlay gilded in gold. Note: You should check with your venue regarding decorating parameters, especially as they pertain to points of attachments for props, and get the relevant approvals. The worst thing that can happen is to have your plans and props arrive only to be told that all decor items must be free standing—that is, you cannot attach anything to ceilings, walls, etc. If such rules apply, a support system would have to be incorporated as part of your plan. 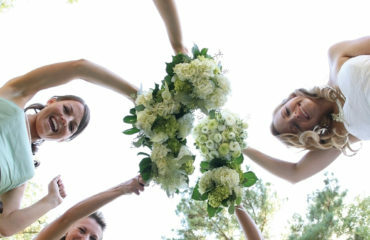 Happy Bridesmaids = Happy Bride!